Soulmates is a short story of the Shadow-Trilogy, a novel series by Marcel Weyers. It takes place a few years before the first novel "Shadows" starts, and introduces the main protagonist Haru and his best friend Yusaku. The novel is a short story about friendship, and is set in a modern day Japanese village. The game can be played in German, English, and Japanese, and is free to download. It works with Mac OS, Microsoft Windows, and Linux. 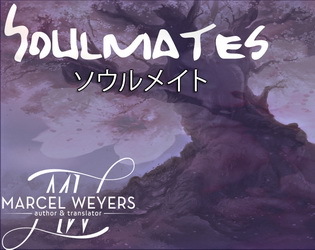 Soulmates was created within three hours and is my first visual novel project.